Sometimes photographers open inquiries an angels sing. That was definitely what happened when Kristina and Tyler inquired with us! I was seriously ready to break down in tears! I’ve always wanted to shoot the Grand Canyon, and alas, I had the opportunity. They had reached out to us a little last minute, AANNNDD the wedding was going to be 3 days before Christmas. But after talking to them and realizing they were totes my people, I had to say yes. The feels on the day were so anticipatory. There was definitely nerves, but to me they didn’t feel hectic. It felt like love. They were both just so excited to get married. These guys had known each other essentially their entire lives, and they were just ready to tie the knot. And also, we might have been a little worried about the government shutting down that morning. But nothing was about to stop them from declaring their love. It was a bit of a drive to Grand Canyon, so a little car time to up the nerves is always good. Then we got there, I immediately got out of my car because I had to see it, and dear god I started crying on the spot! It was sooo freakin gorgeous! 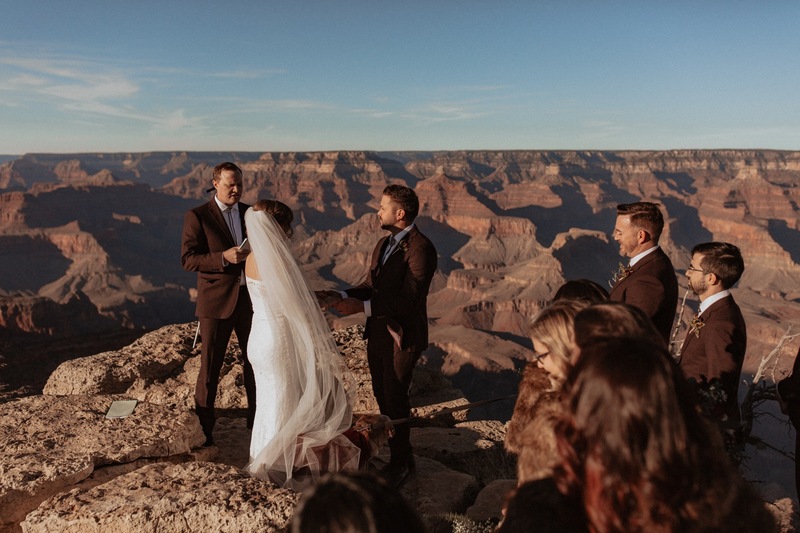 And then it was wedding time, Tyler and Kristina had never been there, so it was sooo amazing seeing their faces as they saw the great expanse that is the Grand Canyon. And boom, just like that, they’re married. A small intimate gathering of about 40 people. It was perfect! Oh yeah. And they had animal masks. Like come on. Yes please.